On Monday night we went swimming at Highbury Pool. Daddy says even looking at a swimming pool makes him hungry so we couldn’t make it all the way home for our tea. 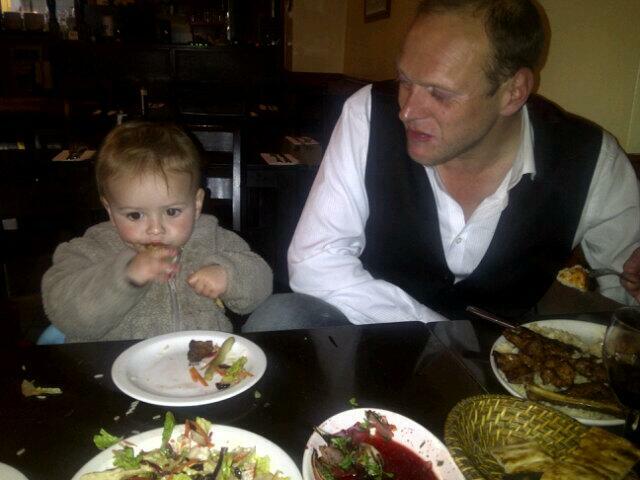 So we stopped off at a Turkish restaurant on Blackstock road which is apparently Dermot O’Leary’s fave place to eat. Daddy ordered five types of meat with loads of salad and I had a bit of everything except for the chillis. The waitress was super nice even when I spilled stuff on the floor, and they had a booster seat that was way more comfy than my high chair at home. My best thing was the flat bread – it’s really fun to eat when you have small hands. Me and Daddy think we’ll come here every week after swimming.